Happy holidays, everyone! Yours Truly, the Google Chromebook team! Google just announced several Chromebook updates that should wash away the holiday blues. First off, prices are dropping. Per a post at Google’s official blog, Chromebooks from both Acer and Samsung will be available starting at $299 “beginning this week.” That’s a $50 price drop on both the Acer AC700 and Samsung Series 5 models although some retailers are currently selling the Acer model at $299 already. No word on if the higher-priced, 3G models are getting a lower price, though. Today’s Chromebook news also includes user interface updates. 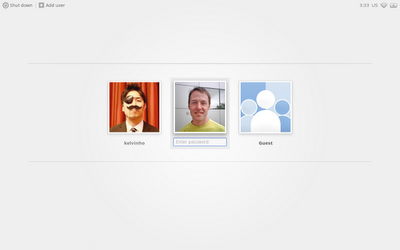 The platform now sports a new swanky log-in screen that simplifies the experience. 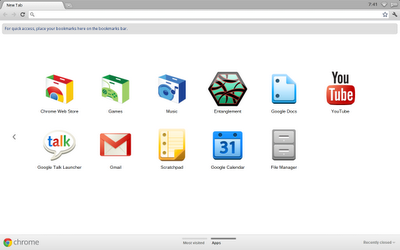 The New Tab page also looks just like the revamped version found in the latest version of Google Chrome. The app and bookmark icons now take center stage while shortcuts like recently closed tabs are downplayed. Google introduced its desktop OS in May of this year. The rethought operating system boots nearly instantly and features an experience completely around its web browser, Google Chrome. However, the notebooks have failed to make a huge splash in the marketplace mostly because of limited marketing and retail placement. Most consumers do not know they exist. But Google does hardware differently and this update shows that the platform isn’t dead (yet). Chromebook retailers such as Amazon and Best Buy have yet to update their pricing — maybe they didn’t get the memo yet. If you have a little extra room in your holiday budget, the WiFi-only Samsung Series 5 now comes in black and retails for $349.